The applet in this section allows you see how probabilities are determined from the exponential distribution. The exponential distribution is a continuous probability distribution and is quite often used to model rates of decay or growth or to model waiting times in a Poisson process. The exponential distribution is completely specified by one parameter: the rate, . The parameter must be strictly positive. Due to limitations of screen size, the applet restricts to values between 0.2 and 5, inclusively. Table 1 contains all the details for the exponential distribution. Table 1. 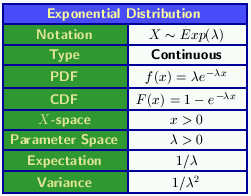 Details of the Exponential distribution. Note: The Central Limit Theorem applet defines the exponential distribution using the parameter . In that case is the mean of the exponential distribution rather than the rate, . The two notations are equivalent by letting =1/ . See also: Probability Distributions, Normal Distribution, T Distribution.